I reviewed a pair of rain boots from Nomad Footwear. They have many different types of shoes to choose from. From sandals, boots, flats, wedges, heels and many others. 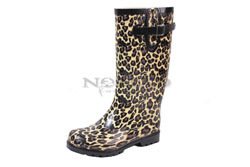 I choose to review the Puddles-Tan Leopard which retails for $50.00. They are super cute and I have worn them in the rain. They are definitely a statement piece. "Rain Rain, go away"...you won't be singing this song anymore once you have the Puddles. Instead you'll be eager to jump in puddles in these durable, water resistant, rain boots. These rain boots are available in a variety of patterns, designs and colors; perfect for any outfit! **Boot patterns may vary slightly from pair to pair. Visit Nomad Footwear and tell me which pair you would choose if you win. I received this item for review purposes only. My opinions are honest and I was not paid for this review. The Seesaw Style No : W7488-Black so Prettyyy! I have added you as a friend on Facebook! I have followed you on Twitter!! I have followed Nomad Footware on Twitter! i am a email comment subbie. I like Nomad Fb pafe and thank them for your giveaway. I have followed also thru my email! I am now following Nomad on twitter. I would choose the Black Wayne boots. my GFC is Kristy. I liked and thanked Nomad on facebook. I followed Nomad Footware and You on Twitter! I would choose the black paisley or turquoise flower...hard decision though, so many cute options. I'd love to win the Wayne in Camel in size 7! Friends on FB as Pixie Sprinkles! Alaska - Rust size 7! I am a GFC follower and I kind of like the Hurricane boots in yellow. tweeted this giveaway for the third time today! I would have to have the Puddles Red/Black Jumbo Dot. We are already friends on Facebook. I like Nomad on Facebook and I thanked them. Dragonbabies is my screen name. I follow Nomad on Twitter. Dragonbabies is my twitter name. I love the Satin flats! I added Noman Footwear and left a comment. Trigger Nomad Boot Tan..........frikkin ROCKS! I follow your blog publicly via Google Friend Connect as shala_darkstone. If I won I'd choose the Mariah heels. I friend you on Facebook (FB name: Maddie Brubaker). I follow Nomad Footwear on twitter (@shala_darkstone).